REBAR is an interdisciplinary studio based in San Francisco and operating at the intersection of art, design and activism. Their work encompasses visual and conceptual public art, landscape design, urban intervention, temporary performance installation, digital media and print design. Rebar has exhibited its work and lectured worldwide, including at such venues and institutions as the Venice Architecture Biennale, ExperimentaDesign Amsterdam, ISEA 2009 Dublin, the Yerba Buena Center for the Arts, the American Institute of Architects, the Canadian Center for Architecture, the Harvard Graduate School of Design, Parsons School of Design, U.C. Berkeley, the Univ. of Michigan, the Univ. of Mass. Amherst and many others. 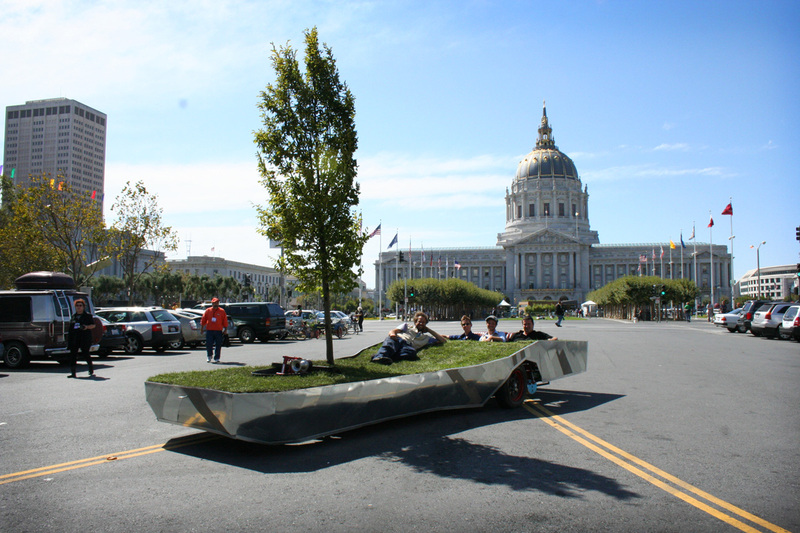 The PARKcycle re-programs the urban hardscape by delivering massive quantities of green open space—up to 4,320 square-foot-minutes of park per stop—thus temporarily reframing the right-of-way as green space, not just a car space.